As a warning, her small hand bunched into a fist. He didn’t care. If she slugged him, maybe that’d finally make him see reason. Maybe he’d finally be able to stop thinking about her." This is an excerpt from a great book I recently read from Lori Foster: A Perfect Storm. Two strangers risk their lives for retribution in New York Times and USA TODAY bestselling author Lori Foster’s intense, edgy and scorching A PERFECT STORM. Spencer Lark and Arizona Storm are thrown together as partners in revenge for the fourth and final book of the Men Who Walk the Edge of Honor series. Following in the footsteps of WHEN YOU DARE, TRACE OF FEVER and SAVOR THE DANGER, A PERFECT STORM features the smoldering mercenaries who will do anything to protect the innocent–especially when those innocent are the women they love. Spencer Lark already knows too many secrets about Arizona Storm, including her kidnapping by human traffickers, her harrowing escape and the painful memories she carries from her past. In order to expose a despicable ring of human traffickers—and continue his mission of revenge for his wife’s death—the bounty hunter reluctantly agrees to partner with Arizona on her latest operation. He quickly realizes no amount of training has equipped him to handle her hypnotic blend of fragility and bravery, or for the protective instincts she stirs in him. This book was a really great read! It has a perfect mixture of intrique, romance, and action to really hold my attention and keep me reading page after page. There is some adult language in this book so I recommend it for adults only! However, I really liked the story line and the life story of Arizona! It made me realize how blessed my life is and how many people have it a lot worse than I do in life! 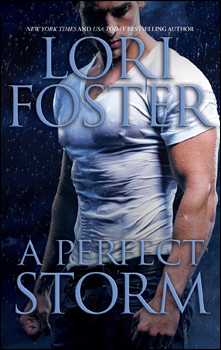 Buy It: A PERFECT STORM is available wherever books are sold, or through www.HQNBooks.com.